I am 46 years old, a well-known professional in my field and well-known socially in my community, and recently married for the first time. I never thought I would get married, not because I could not find “Mr. Right” but because I was far too busy enjoying life to even bother looking for him. What I am trying to illustrate for you is the fact that I have a well-established identity of my own and do not wish to lose it now that I am married; to this end, I have retained my maiden name. Tazi, in spite of my husband’s support for my decision people still feel the need to criticize, suggesting that I am somehow not committed to Frank. For Heaven’s sake, I took vows before God and family; you would think that was enough to show my commitment to him! Still I have had to put up with being called everything from “scared to commit” to a “Femi-Nazi”, a term I find particularly offensive considering that I am a quarter Jewish. I have reached the point where I am tired of being polite, but don’t wish to be rude to people over this private matter. Do you have any suggestions for a polite comeback to these rude comments? People who call someone a “Nazi” simply because they believe differently do not deserve your respect. Unless, of course, the person to whom they are referring is a Neo-Nazi, in which case the term is correct but there are bigger issues at hand. I’m digressing, aren’t I? Not being the slightest bit Jewish, I cannot even begin to comprehend the level of hurt and rage you must feel when lunkheads use such an offensive term. Here is a Paw Slap of Disgust for you to hand to these people the next time they use that term! As for everyone else, these people appear to be firmly ensconced in the tradition that when a woman marries she takes her husband’s last name for the sake on family unity and the hereditary line, issues that do not appear to be of concern to you but which may explain the reaction you are receiving from others. 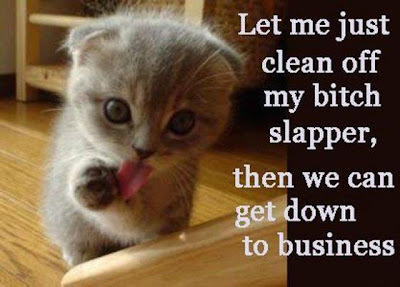 Being a cat, I generally am not polite to those I tell off – with a cat, you always know where you stand! However, I understand human relations ad that they require a certain amount of civility, even when civility is not provided in the first place. One way to politely shut up those who feel they deserve to have an opinion about your private business is to tell them your reasoning for keeping your maiden name: That just as your husband it firmly attached to his identity so you are to yours. Explain that you do not love him any less for not taking his name, but love him all the more for being understanding, accepting, and supportive of your choice; if this response does not make the questioner feel like a complete jerk than nothing will. P.S. My Mommie will also be a first-time bride this coming April, and she is in her 40's, too! However, she will be making her maiden name her middle name and taking on a new last name.